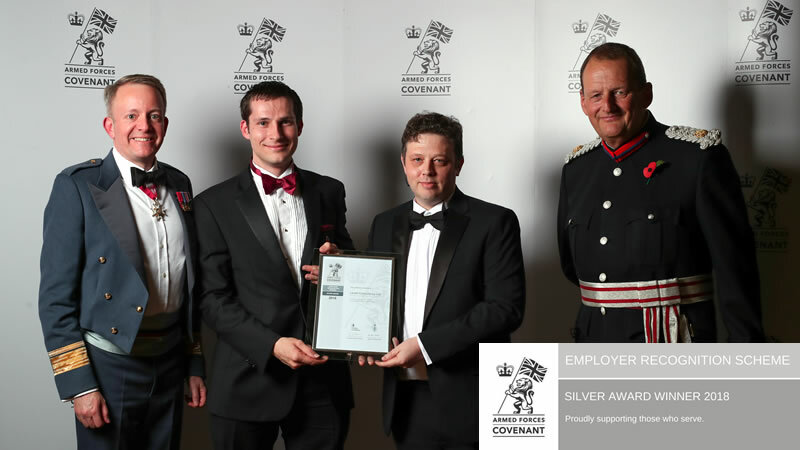 On Thursday 8th November the company was awarded the Silver Covenant award as recognition of supporting and helping armed forces community aligning our values with the Armed Forces Covenant. Paul Levett, Joanne Levett, and Vinnie Burtonshaw received the award from the Deputy Lieutenant of Cambridgeshire and RAF Air Vice-Marshal Richard Knighton. As proud supporters and participants of the of the Defence Employer Recognition Scheme (ERS), the company was very honoured to have received the award. Through our Community Programme working with the Career Transition Partnership (CTP) the company helps service personnel and their families transition from service life to civilian life by providing work placements with ourselves to help provide them with the necessary skills and experience to start a new career in the technology sector. The company also works with our partners to provide discounts to events through the Defence Discount Service. If you would like more information on Defence Employer Recognition Scheme please contact us or visit our community section here.